Are people ready to stop being 'sheeple' and start fighting back? Dozens of people rode their ATVs and motorcycles on an off-limits trail in southern Utah on Saturday in a protest against what the group calls the federal government's overreaching control of public lands. 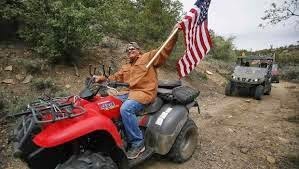 San Juan County Sheriff Rick Eldredge said from 40 to 50 people, many of them waving American flags, drove about a mile down Recapture Canyon near Blanding and then turned around. Hundreds attended a rally at a nearby park before the protest. "It was peaceful, and there were no problems whatsoever," the sheriff told The Associated Press. "The BLM was in Recapture Canyon today collecting evidence and will continue to investigate," Palma said. "The BLM will pursue all available redress through the legal system to hold the lawbreakers accountable." Bureau of Land Management officers recorded and documented protesters who traveled into the closure area, he added.